My new mobile phone was really meant for me to be able to connect to the net at higher speeds. Unfortunately, Smart Communications has a better deal in internet usage, P10. 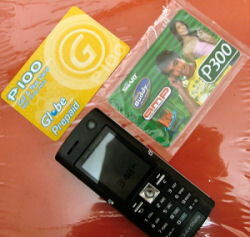 for 30 minutes as opposed to Globe's P0.10 per kilobyte I think. Problem is my mobile number for the past 7 years has been a Globe number. It seems so hard to switch cause I have to inform each and every person who knows my current number that I'll be using a new number. Also, I love my current number cause it has a lot of "7's" in it and kinda easy to remember. With the switch also comes some planning. I have to let everybody know of my new number and bulk of the work is figuring out who exactly is "everybody". Hopefully, I'll be able to do this all within a week's time.